Last September, during APNIC 44 in Taichung, I presented the report of the independent Address Supporting Organization (ASO) Review that was carried out in 2017. This review gave a positive evaluation of how the ASO has been functioning in recent years, but also made 18 recommendations for improvements. Most of these recommendations were well defined and non-controversial, and can be implemented by updating administrative procedures and documentation of the ASO. The last recommendation, however, was more substantial. It suggested conducting community consultations, in each of the five Regional Internet Registry (RIR) regions, to determine the future structure of the ASO. In preparing for the consultation, the APNIC EC also agreed on some inputs to the session, as guidance for consideration by the community. In particular, the EC encouraged the community to consider the report’s ‘non status-quo’ options, to find genuine improvements to the ASO structure. This first consultation session was mostly informative, and resolved to establish a working group that could take the discussion forward. This group is now active and is being convened by community members Izumi Okutani and Aftab Siddiqui. Like other APNIC working groups, this group is open to all members of the community with an interest to participate, and details are available on the APNIC website. 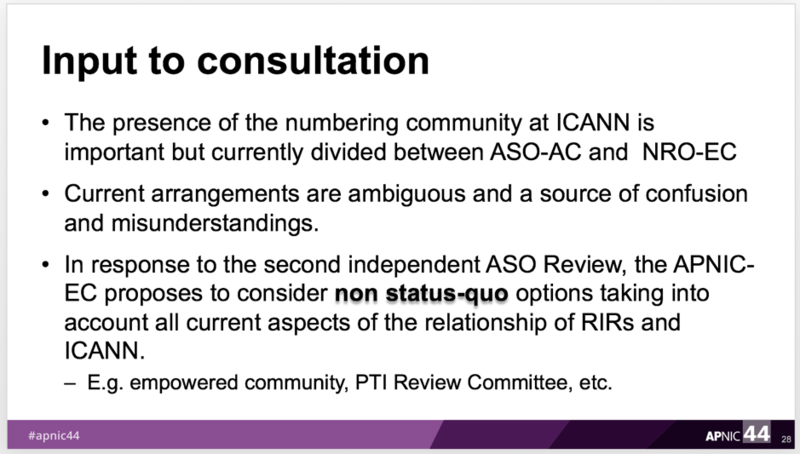 While the APNIC EC considered the ASO Review report during September 2017, it took some time before all the RIRs were able to do the same. Two weeks ago, the NRO Executive Council (NRO EC) and the ASO Address Council (ASO AC) published a joint response to the ASO Review recommendations. In this response, they collectively accepted the recommendations of the report and confirmed the call for public consultations, per recommendation 18. The idea, of course, is that the future structure of the ASO is determined by the RIR communities collectively, according to our traditional bottom-up consensus processes. Any updates and adjustments to ASO-related documents, such as the ICANN Bylaws and the ASO MoU. Any procedural clarifications and adjustments. Reported confusion of roles between the ASO and the NRO, and their components. Perceived complexity of relationships among the NRO, the ASO and ICANN. Relevance and cost to the RIRs of various ICANN engagement activities. Global Policy Development Process (GPDP). ASO AC role with the GPDP. 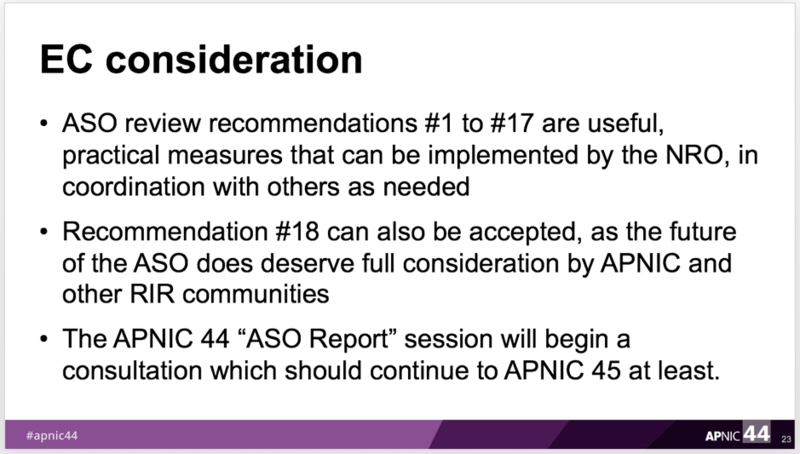 An ASO Review session has been scheduled at the upcoming APNIC 45 meeting and will be important as part of a global process that will suggest improvements on how the RIRs interact with ICANN in the future. I do hope that interested members of the APNIC community will join this session and help to determine the future form of the ASO. In preparation for the session, I participated last week, together with Izumi Okutani and Aftab Siddiqui, in a Facebook Live session to discuss the ASO Review process (see below). I recommend watching the video before APNIC 45 and also joining the working group’s mailing list. I look forward to seeing you in Kathmandu, either in person or online via remote participation.